For anyone who hasn't driven on Balsam Mountain Road in the southeastern area of the Great Smoky Mountains, this is your chance to see what your missing. The Great Smoky Mountains Association has a new video posted to their website providing an excellent overview of this spectacular scenic drive. Please click here to view it. As a result of next week's 75th Anniversary Park Rededication Event at the Newfound Gap Parking Area, the Newfound Gap Road (U.S. 441) between Cherokee, NC and Gatlinburg, TN will be closed from sunset on Tuesday September 1 until late afternoon on Wednesday September 2. This closing will impact several trails, shelters, campsites and other facilities. This includes a section of the Appalachian Trail. • US-441 (Newfound Gap Road) between Gatlinburg, TN and Cherokee, NC will be closed from the gate at Sugarlands to the gate at Smokemont, from sunset on Tuesday, September 1 through approximately 6:00 p.m. on Wednesday, September 2. • Clingmans Dome Road will be closed at the gate at Newfound Gap Road, from sunset on Tuesday, September 1 through approximately 6:00 p.m.on Wednesday, September 2. • The Newfound Gap parking lot will be closed to all parking from sunset on Sunday, August 30, through approximately 8:00 a.m.on Thursday, September 3. • The Oconaluftee Overlook will be closed from sunset on Sunday, August 30 through approximately 6:00 p.m. on Wednesday, September 2. • Note: All facilities reached by Newfound Gap and Clingmans Dome Roads, i.e. the Collins Creek and Chimneys picnic areas as well as trailheads along the roads, will be closed concurrent with the road closures posted above. • The Appalachian Trail (A.T.) will be closed from the Sweat Heifer junction to the Goshen Prong junction, from sunset on Tuesday, September 1 through 6:00 p.m. on Wednesday, September 2. > Alum Cave Bluff Trail, entire length, except that persons with a reservation for Le Conte Lodge on September 1 or September 2 will be allowed to use the Alum Cave Bluff Trail for ingress and egress. Lodge guests will be prohibited from driving south of the Alum Cave Bluff trailhead during the Newfound Gap Road closure. > Sugarland Mountain Trail, from the junction with the Rough Creek Trail to the terminus at the A.T.
• Double Springs Gap, Mt. Collins, Icewater Springs, and Kephart shelters will be closed for the nights of Sunday, August 30, through the night of Wednesday, September 2. The shelters will reopen Thursday, September 3. • Backcountry campsites #53 and 68 will be closed from the night of Monday, August 31 through the night of Wednesday, September 2. The other day I decided to put together a list of my top 10 outdoor related websites. The list includes outdoor news, hiking, trails and blogs that I find useful and/or entertaining. Maybe you’ll discover a new site from this list for yourself. Although I just said that I wouldn’t list these sites in order, I’m going to break that rule right from the start. For me, Summit Post is heads and shoulders above all other outdoor websites. Although the site is completely user generated, you’ll find most posters to be great story tellers. You’ll find excellent articles, stunning photography and informative trip reports for hiking, mountaineering and climbing spots all over the world. 14ers.com is another excellent website for people looking for detailed information on hiking and climbing the 53 peaks that rise above 14,000 feet in Colorado. The site is well organized, includes difficulty and exposure ratings, as well as plenty of route pictures and information on how to get to each trailhead. Discovering Lewis and Clark - this website includes an overwhelming amount of information on the ultimate American adventurers. In addition to finding articles dealing with different aspects or events of the expedition, you can find excerpts from the journals, coupled with commentary offering historical background. You can also listen to the day by day radio accounts of the expedition that originally aired on Yellowstone Public Radio during the bicentennial (2004-2006). Knowing that Smoky Scout finished her Girl Scout Challenge back in April, that is, hiking all 800+ miles of trails in the Great Smoky Mountains – in one year - to raise money for the Scouts, you would think that she would be ready for a long rest. That hasn’t been the case. In late spring, as her husband bicycled the Blue Ridge Parkway, she spent time hiking the many trails along the way. Just recently she returned from a backpacking trip in the Grand Tetons and is in the process of documenting that trip on her blog as well. With excellent articles and photos, her blog has become a great resource for hikers. The National Parks Traveler is, as you might expect, everything about our national parks. The only way that you could know more about what’s going on across the entire national parks system is to work at the Department of Interior offices in Washington DC. Anyone who has read this blog for a long time will know that I’m a cyclist and a pro cycling fan. There’s no better way to keep up with what’s going on in the cycling world than checking in on VeloNews. John Wilcockson in particular is an excellent features writer. I recently discovered Canoe-camping.org. This is a great resource for organizing and researching multi-day canoe trips. Although I’ve never done any multi-day canoeing, I’ve had my eye on a few trips, including the Green River in Utah, the upper-Missouri in Montana (Lewis and Clark country!) and the St. Croix in Wisconsin. The Adventure Blog is the best source for keeping up with all things adventure. Kraig Becker, the author, has all the latest news and updates on adventurers, expeditions and epic races from around the world. The Highpointers Guide is an excellent resource for anyone seeking information about reaching the highest point in each state. My wife and I have been passively knocking out state high points during vacations over the last couple of years. To date we’ve reached the highest point in 13 states, including Colorado and New Mexico. There are a few we know we’ll never do, namely Denali in Alaska, but we do hope to settle for about 40 before hanging up our boots. Buck Track is Bruce "Buck" Nelson’s personal website. Bruce is a modern day explorer. Although it appears he isn’t currently doing anything, it was fun tracking his blog last year as he hiked the Continental Divide Trail from Mexico to Canada. Prior to that, he did a solo 1000-mile trek across the Brooks Range of Alaska. He has a nice short video on his site documenting that trip (you can also buy the extended DVD). Alright, what do you guys think? Are there any sites that I missed that should be included on this list? Below is another fine video from the Great Smoky Mountains Association. The five-minute video is a highlight tour of Cades Cove. "This is the time of year to have your binoculars at the ready as these neotropical migrants gather in flocks, or kettles, to head for their winter grounds in Southern Mexico, Central America, and northern South America, with some immature birds over-wintering in southern Florida. The first cold front comes through around September 5-15. With it these buteos follow the Appalachian mountain range, riding the thermals over land. 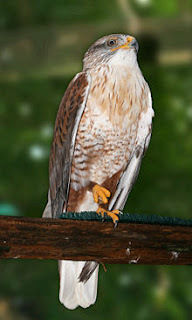 They are often seen accompanied by other raptors and are one of the first species to start the migration south. Flocks can be quite large and the best vantage points are in the higher elevations, i.e. Newfound Gap, Clingmans Dome, Look Rock, and Indian Gap." 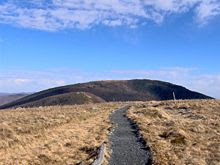 The Appalachian Trail Conservancy is looking for a few volunteers to help cut back the large woody shrubs growing on Roan Mountain in order to maintain the mountain as a bald. The ATC is asking volunteers to use those certified chainsaw skills or lopping skills to cut back woody growth and protect the rare grassy balds habitat in the Roan Highlands of NC and TN. All skill levels are welcome. Volunteers should meet at Carver's Gap on August 28 and or August 29 at 9:00 am. You'll hike about 1.5 miles to the worksite work site and should return around 4:00 pm each day. Everyone knows that using fabric softener sheets is a great way to keep your yellow jacket soft while it's being washed. But did you know that fabric softener sheets can be used to keep Yellow Jackets away from you while hiking? According to an authoritative source, the U.S. Postal Service, apparently it's true! Thanks to the Carolina Mountain Club for that tip! Check out this video of a family of wild boars in the Smokies. The video was posted to Youtube a couple of days ago by Kevin Umberger from WBIR in Knoxville. I, for one, have never seen a wild boar in the wild. Right now they're offering a year's subscription to Backpacker Magazine for just $5.00! This offer expires August 22. For all you Samantha Brown fans out there, make sure to pull-up a couch in front of your TV this Saturday. The star of Great Weekends on the Travel Channel will be on location in the Great Smoky Mountains on this weeks episode. "Samantha's tapping into her rugged side and trailblazing her way through the Smoky Mountains, exploring underground taverns and taking a night hike in the dark. This is a 'roughing it' weekend as it was meant to be." "Underground taverns"? Were these some old, subterranean speakeasy hideouts under Gatlinburg during prohibition that they're referring to? Or did the webmaster make a spelling mistake, meaning to say "caverns" instead? I guess we'll find out Saturday night. The shows begins at 10:00 pm, EST, with several repeats thereafter. Check out this footage of a young male bighorn sheep attempting to challenge an SUV. The unusual video was shot in Sinks Canyon State Park near Lander, Wy. We're open for business! From books related to hiking and the Smoky Mountains, to hiking gear and apparel from some of the best outdoor brands, including; Columbia Sportswear, Kelty, Garmin, Leki, Marmot, Mountain Hardwear and North Face. Please click here to visit our store. You can also support this blog and our HikingintheSmokys.com website by shopping directly from Amazon’s new Outdoor Recreation Store (using this link). Amazon.com is currently offering customers an opportunity to receive a FREE National Parks and Federal Recreational Lands Pass with qualifying purchases. This is an $80 value! Amazon's Outdoor Recreation Store offers a full array of gear for almost any outdoor pursuit, including tents, backpacks, sleeping bags, apparel, gear essentials, snow sports, paddling sports, active travel and climbing. Next Friday, August 21, the In View of the Smokies/Celebrating 75 Years exhibition opens at the Arrowmont School of Arts and Crafts in Gatlinburg. As part of the 75th anniversary celebration of the Smokies, the Arrowmont School will be exhibiting spectacular images of Great Smoky Mountains National Park. The exhibit will run from 8/21/2009 through 10/10/2009. Next Friday there will be an opening reception from 6:00 - 8:00 pm, which will include edible delights from Arrowmont's kitchen! There will also be an awards program at 7:00 pm. A new event for runners is set to take off next April, organizers announced this week. The inaugural Blue Ridge Marathon is planned for April 24 in Roanoke, and will be the first marathon to be run almost entirely on the Blue Ridge Parkway. The event is touted as "one of the most difficult and beautiful marathons on the east coast," according to race organizers. The run will start and end in Roanoke and will include steep climbs and descents on Mill Mountain and Roanoke Mountain. The course includes 3076 feet of total elevation gain and 6140 feet of total elevation change! 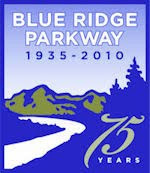 The event was planned to coincide with the 75th anniversary of the Blue Ridge Parkway. Proceeds will benefit Friends of the Blue Ridge Parkway, a non-profit group that works to protect viewsheds along the parkway. Due to the nature of this event, the full marathon is limited to a maximum of 400 runners, however, a half-marathon is also planned. The Great Smoky Mountains Association recently posted a new video on their website showing Cataract Falls and Laurel Falls right after the heavy rains of July 31. It's a very well done video showing the heavy flows of water on both falls. The Mountain Music Championship is a fun filled day of mountain music, food and friendly competition. Individual and band competitions in both old-time and bluegrass music categories for the fiddle, banjo, mandolin and guitar are held. The championship will be held on September 5 at the Stecoah Valley Center's Historic Auditorium in Robbinsville, NC. The event will be from 11:00am - 10:00pm. $5,000 in prizes will be awarded. Great mountain BBQ will be available all day, as well as onsite camping. Adult afternoon pass $5, adult evening pass $7, all day adult pass $10, students $2. Blue Ridge Outdoors Magazine is wanting to know what your favorites are - that is, your favorite places, faces, and races in the Blue Ridge area. What is your favorite trail? Your favorite waterfall? The best section of the Appalachian Trail? Plus many others. If you would like to give your opinion and participate in the survey, please click here. This Thursday, August 13, is the annual Friends Across the Mountains Telethon. The telethon will be broadcasted on WBIR-TV Channel 10 in Knoxville, TN and WLOS-TV Channel 13 in Asheville, NC from 7:00 PM - 8:00 PM. The broadcast highlights projects and programs that Friends of the Smokies has funded. It's both educational, and important, as the telethon raises approximately $200,000 each year. It's a fun event that raises awareness of both the Park's needs (as the only major national park without an entrance fee) and the ways that Friends of the Smokies helps to fulfill some of those needs every year. Smokey Bear turns 65 today! Happy Birthday to Smokey Bear, the mascot of the U. S. Forest Service created to educate the public on the dangers of forest fires. 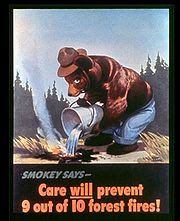 Smokey Bear's famous message "Only You Can Prevent Forest Fires" was created in 1944 by the Ad Council. It’s the longest running PSA campaign in U.S. history. Smokey's correct full name is Smokey Bear. In 1952, the songwriters Steve Nelson and Jack Rollins had a hit with "Smokey the Bear". The pair said that "the" was added to Smokey's name to keep the song's rhythm. This small change has caused confusion among Smokey fans ever since. Smokey's debut poster (see picture above - on right) was released on August 9, 1944, which is considered his birthday, making him 65 today. 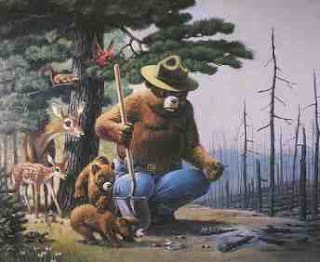 Be sure to check out the Smokey Bear website to see the history of the AD campaign. The site includes an interactive trail by decade with an extensive collection of old posters, TV/radio spots (including the famous Bambi TV spot), and other memorabilia. The Gear Junkie just launched its second 'Choose-Your-Adventure' Sweepstakes! A winner and a guest will pick between 5 adventure-vacation itineraries this fall in the Alleghenies of Pennsylvania. Additionally, you’ll receive a gear package to get outfitted for the trip. Each of the five packaged adventures includes a variety of activities, such as fishing in mountain streams, kayaking on local lakes, hiking scenic trails, and road biking through the Allegheny Mountains. In all, the randomly-drawn content winner and a guest of his or her choice will receive airfare, an all-expenses-paid vacation, professional guiding, plus gear from sponsor companies. Gear Junkie readers and the general public can enter now through Sept. 15 for a chance to win. A couple weeks ago Smokies officials announced plans for a repaving project for the Cosby Campground as part of the federal stimulus plan. Yesterday, on the Smokies website, officials announced that trailhead access from the Cosby Campground to Lower Mount Cammerer Trail, Snake Den Ridge Trail, and Low Gap Trail will also be closed due to the project. The closing begins on Labor Day, September 7, 2009. Although trailhead access within the campground will be closed, these trails will remain open and hikers will be able to access them via connecting trails from the nearby Picnic Area parking lots. Amazon.com is offering an opportunity to receive a FREE National Parks and Federal Recreational Lands Pass. Go to Amazon’s new Outdoor Recreation Store for more details. The summer issue of the American Trails Magazine is now online. The quarterly magazine published by American Trails, the only national, nonprofit organization working on behalf of all trail interests, covers news, legislation, action items, trainings, success stories, events, people making a difference, creative funding ideas, the latest resources, information on products and services you may need. The theme of this issue is "America’s youth, America’s trails." You can find the magazine by clicking here. Elk are notorious nibblers of veggies and flowers. In response to elk devouring the planted garden at the Mountain Farm Museum, rangers at the Oconoluftee Visitor Center and wildlife managers agreed to set a motion-activated alarm from 7:30 at night to 7:00 each morning. Visitors should be aware of the alarm, because they could set it off if they walk in the alarmed areas at night. You may recall the raging debate this past spring over whether or not bear spray is legal in the Great Smoky Mountains or not. The debate was the result of confusion from the way the law was written, and the fact that there is a legal instument called a 'Superintendent's Compendium', which allows park managers to make local adjustments to certain laws pertaining to national parks. Back in early May, Chris Hibbard at Your Smokies, was told in writing by Great Smoky Mountains National Park officials that "there is no legal form of bear spray allowed in the Great Smoky Mountains national park and like any other weapon, trap or net, it is illegal to carry, possess or use in the Great Smoky Mountains national park". At that time, this official statement seemed to put an end to the debate once and for all. "Bear pepper spray may be carried by hikers within Great Smoky Mountains National Park for the strict purpose of protection against bodily harm from aggressive wildlife. It should not be applied to people, tents, packs, other equipment or surrounding area as a repellent. Bear pepper spray is a chemical formula designed specifically to deter aggressive or attacking bears. It must be commercially manufactured and labeled as “Bear Pepper Spray" and be registered with the Environmental Protection Agency and individual states. Bear spray must contain between 1% to 2% of the active ingredients capsaicin and related capsaicinoids." I want to clarify new procedures for the use of Bear Pepper Spray. We have previously considered Bear Spray to be a weapon as defined by 36 CFR 1.4, a gas irritant device. Recent conversations with the Washington Office have gotten them to develop an opinion of the language of the regulation. Homeland Security does not consider Bear Pepper Spray to be a weapon for purposes of travel across the international boundary. It is considered a pesticide or a repellant. As long as the the product is used in accordance with the manufacters recommendations, it would not be considered a weapon. There fore we have incorporated new guidlines into our compendium. Bear Pepper Spray – Also known as bear deterrent, bear repellent or bear spray . Bear pepper spray is a chemical formula designed specifically to deter aggressive or attacking bears. It must be registered with the Environmental Protection Agency and individual states. It must be commercially manufactured and labeled as “Bear Pepper Spray”. Bear spray must contain between 1% to 2% of the active ingredients capsaicin and related capsaicinoids. Bear pepper spray may be carried by individuals within Great Smoky Mountains National Park for the strict purpose of protecting one’s self or others from bodily harm against aggressive wildlife. It should not be applied to people, tents, packs, other equipment or surrounding area as a repellent. Managers at Great Smoky Mountains National Park announced yesterday that the section of the un-completed Foothills Parkway extending west from Wears Valley Road has been re-opened to non-motorized recreational use. Kevin FitzGerald, Deputy Superintendent at the Smokies said, "Now that construction activity has been completed for the time being, we welcome the public to hike, ride their bikes or bring their horses onto both sections of the un-finished Parkway. People can go in either from Wears Valley and travel about 4 miles to the dead-end at the Missing Link or they can come in at the Walland end and travel over 9 miles before they have to turn around. The 1.25 miles of the Missing Link between the two partly finished sections is very rugged and overgrown and is closed to horses and bikes and not recommended to hikers." The park expects to close both sections again when construction resumes: next spring on the Walland end, and sometime in the summer or fall of 2010 on the Wears Valley segment. Early last month, the secretary of the Department of the Interior, Ken Salazar, recently designated 22 trails in 13 states, as newly recognized National Recreation Trails, adding more than 525 miles of trails to the National Trails System. The National Trail System Act of 1968 authorized creation of a national trail system comprised of National Recreation Trails, National Scenic Trails and National Historic Trails. While National Scenic Trails and National Historic Trails may only be designated by an act of Congress, National Recreation Trails may be designated by the Secretary of Interior or the Secretary of Agriculture to recognize exemplary trails of local and regional significance in response to an application from the trail's managing agency or organization. Through designation, these trails are recognized as part of America's national system of trails. To see the complete list of new trails added to the system, please click here. Managers at Great Smoky Mountains National Park have announced that the Newfound Gap Road (U.S. 441) between Cherokee, NC and Gatlinburg, TN will be closed from sunset on Tuesday September 1 until late afternoon on Wednesday September 2. The closure will allow the Park to conduct a 75th Anniversary Park Rededication Event at the Newfound Gap Parking Area on September 2. • Russell Field Shelter• Double Springs Gap, Mt. Collins, Icewater Springs, and Kephart shelters will be closed for the nights of Sunday, August 30, through the night of Wednesday, September 2. The shelters will reopen Thursday, September 3. The Smithsonian’s National Museum of American History recently opened a new exhibit about Earl Shaffer and his first thru-hike of the Appalachian Trail. Entitled, “Earl Shaffer and the Appalachian Trail,” the exhibition will be on view in the Documents Gallery until October 11, 2009. If you can’t make to Washington DC, you can still view a version of the exhibition online by clicking here. Please contact Allison Tara Sundaram if you have any questions. In 1948, young WWII veteran Earl Shaffer walked into the history books as the Appalachian Trail's first thru-hiker. In 1998, on the 50th anniversary of that hike, as a 79-year-old, Earl did it again. 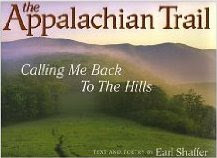 In The Appalachian Trail: Calling Me Back to the Hills, Mr. Shaffer recalls his 1998 anniversary trip and pays homage to the AT through his prose and poetry. The book has been enhanced by dozens of stunning photographs by thru-hiker Bart Smith. The Carolina Mountain Club is extending an invitation to anyone interested in helping to extend the Mountains-to-Sea Trail (MST) on Saturday August 22. The club hopes to have a large group to help complete another piece of the MST going south to the Soco Gap Overlook, South of Balsam Gap - Blue Ridge Parkway milepost 456. Volunteers will meet at the Moose Cafe; at 9:00 AM for car pooling. The second meeting place is at the intersection of the Blue Ridge Parkway and Rt. 19, South of Maggie Valley. Tools will be available but if you have digging tools of your own, please bring them. No prior experience is required. For more information, please contact Piet Bodenhorst. Experience the Smoky Mountains from a different perspective this fall by working and camping on the Appalachian Trail. Between September 1 and November 1 of this year, volunteers can join the Rocky Top Trail Crew and work in the heart of the largest and most beautiful wilderness area in the east. The Rocky Top Trail Crew is a professionally lead volunteer trail crew on the Appalachian Trail in Great Smoky Mountains National Park. The program, developed and administered by the Appalachian Trail Conservancy (ATC), was designed to incorporate significant contributions from both the hiking and the equestrian communities. Each week, a team of horses’ packs up tents, food and tools for volunteers who will live and work together on the trail for 7 days. 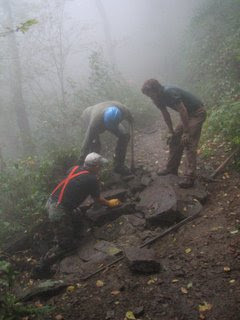 The crew's work will involve reconstruction of those sections where horses and hikers share the trail. The ATC will provide volunteers with the equipment, food, tools and training to engender a safe, fun and fulfilling Smokies experience like no other. If you’re looking to give back to Great Smoky Mountains National Park on its 75th birthday, there’s no better way than to roll up your sleeves and get dirty while helping to manage and protect America’s first national scenic trail for future generations. For more information and to find an application, please click here.